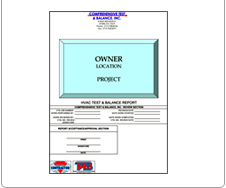 Comprehensive Test and Balance Inc.
CTB Inc specializes in the testing and balancing of Air and Hydronic Systems by offering a full line of services from building commissioning to the balancing of individual systems for all types of commercial and industrial applications. CTB Inc has extensive experience in the field of testing and balancing of Utility systems. CTB Inc provides comprehensive commissioning of new and existing systems to maximize the systems efficiencies and ensure a reliable, high quality level of ongoing operation.